Cody Townsend and Le Bent have collaborated to create the ultimate touring sock. 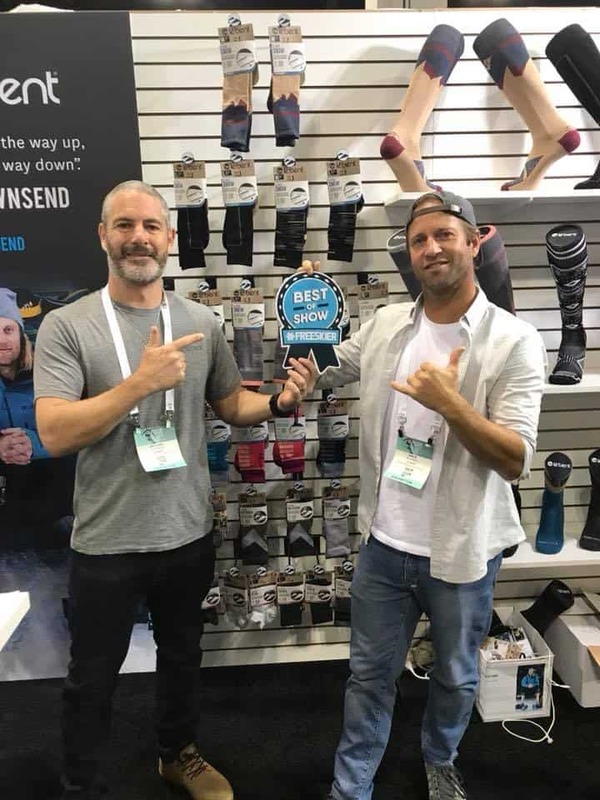 Le Bent, the Australian sock and base layer company, is making in-roads into North America and the growing brand received a boost last week, winning a couple of awards at the combined Outdoor Retailers and Snow Sports Industries America trade show in Denver. The company’s latest ski sock, called Le Send, won a “Best in Show” award from Freeskier Magazine and also the “Best New Gear Award” from the Gear Institute. Le Bent founders Ant Symonds, left, and Simon Blondel, celebrating the best in show award from Freeskier. Cody Townsend spends more time in the backcountry than most and the long hikes take their toll on your feet, so Townsend and Le Bent go together to design the first sock specifically for ski touring. The aim was simple – to keep your feet warmer, drier, and more secure in the boot. To keep the feet warmer, the thickness of the fabric in the toe of the sock was doubled to accommodate the wider toe box found in most touring boots. Then, because vascular constriction creates the feeling of cold, the designers removed the typical compression element in the forefoot and applied a subtle compression in the calf for muscle support. Wet socks from sweat are a problem when touring and an innovative weave pattern on the upper forefoot of the sock increases breathability when the feet heat up from touring and hiking. Combined with le bent’s proven signature blend of merino wool and rayon from bamboo, the sock will naturally vent moisture away from your feet. 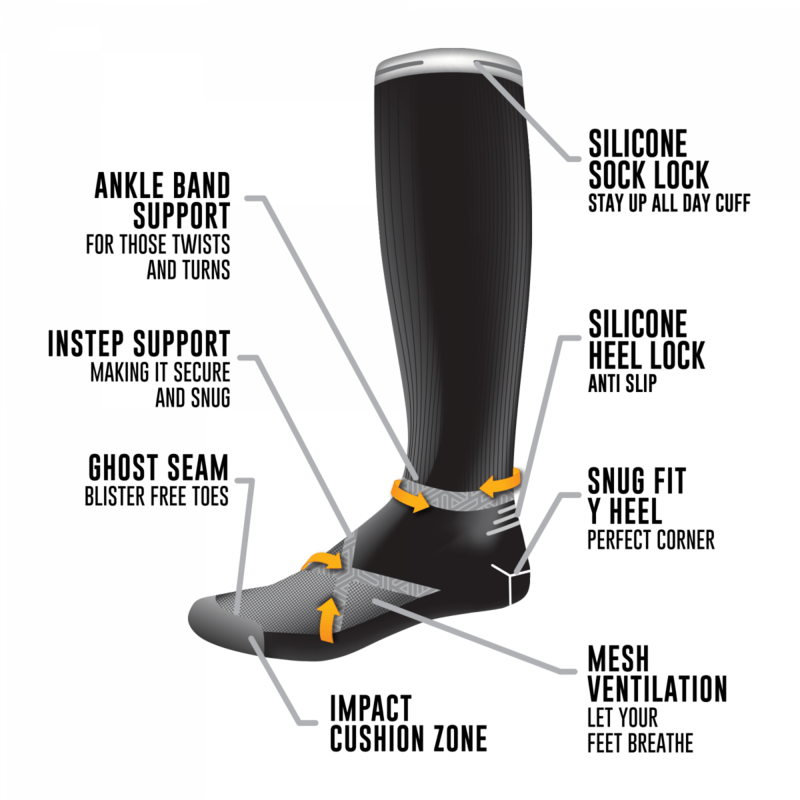 To keep the sock secure in the boot and minimise blisters, welded silicone strips were placed on the heel to lock down the from any sort of upward slippage while touring, boot packing and skiing. Says Townsend, “It’s the simplest solution to a problem that caused blisters, inefficiencies in hiking, less downhill performance and generally drove me crazy.” This silicone strip is also placed on the inner edge of the upper cuff to solve the ever-annoying downward slippage of your sock. He’ll be giving the sock a good work out this winter as he undertakes his latest project The Fifty, to climb and ski the lines named in the 50 Classic Ski Descents of North America. The Le Send touring sock will be available in September. Check out the full Le Bent range on the Mountainwatch store.